Editor’s Note: This is a guest post by Greer Arthur, a postdoctoral researcher in molecular biomedical sciences at NC State. The story first appeared in NC State’s postdoctoral magazine, Verve, which Arthur edits. On a sunny afternoon in North Carolina, Ahmed Mohamed sits in a coffee shop more than 4,000 miles away from his childhood home in Mauritania, Africa. As he describes his previous life as a desert nomad, it quickly becomes apparent that his journey – across decades, careers and continents – was made possible by a remarkable tenacity. This tenacity, while a quality paramount for a career in research, played a prominent role in Mohamed’s childhood years before he even realized the existence of science as a practice. Photo courtesy of Ahmed Mohamed. The setting sounds thrillingly stark, faraway and beautifully uncomplicated. But for someone with an inquiring mind, the endless drifting of a nomadic lifestyle would only take him so far. As soon as he was old enough, Mohamed, like many nomadic travelers, started school. But after one particularly severe drought, his family was forced to trek further and his daily journey to school stretched to more than 100 miles. To continue his education, he left his nomadic life behind to live with relatives in a comparatively built-up, urban area. “These ‘urban’ places were very different to the western idea of urban,” Mohamed notes. “Where I lived with my relatives, it was still very rural. 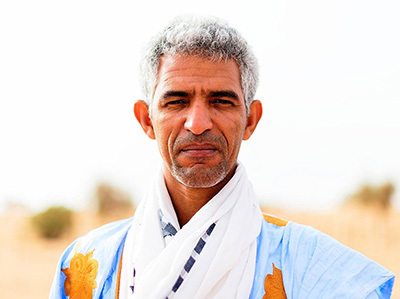 The only difference was that people stayed in one place rather than travel around.” The decision to change his lifestyle would ultimately lead to him leave Mauritania altogether. “I graduated in 1992,” Mohamed says. “But at that time there were no universities. There was no science.” Unable to provide further education, the Mauritanian government ranked its students according to their high school grade point average and sent them to foreign universities, a process that tested Mohamed’s non-conformist nature. Rather than choose for themselves, a ranking system dictated the next step in their education; high achievers were sent to study what were considered the most useful fields, while lower-ranked students studied subjects that were predetermined to be equivalent to their aptitudes. “I was sent to Libya to study veterinary medicine,” says Mohamed. “But that wasn’t what I wanted to study. It took me one year to come to terms with that, but it was partly because of my ignorance.” He recounts the fact that he was the first of his extensive family to attend university. The notion of a career path was entirely new, but having never left Mauritania before, specialist jobs such as being a veterinarian seemed incomprehensible and irrelevant. “I would’ve preferred to study human medicine because from what I could see it had more purpose. I had no appreciation for veterinary medicine,” he explains. By the time he graduated with his veterinary degree, Mohamed had developed a fresh respect for the discipline and the abundant knowledge and diversity in the world. His return to Mauritania was tough. While he had breached a boundary and tasted a different life, the open wilderness he returned to seemed suddenly confining and restrictive. In a country without universities, employment prospects for veterinarians were unsurprisingly limited. What’s more, he had experienced a domain in which questions were encouraged and new knowledge was not only pursued, but created. He needed to know and see more, so decided to travel to a new country. But his plan was not to head straight for school. Instead, he found a job in a food processing company in rural Kentucky. “My family was poor, so I didn’t have lots of money to travel and I had to make it on my own,” Mohamed says. Supporting his new lifestyle independently, he describes how he steadily built himself a new home, but emphasizes that he never accumulated money. “I always shared my money with my family.” However, he says, he never surrendered his plans to study, something his family wholly supported. “In my culture, people are valued for their characters and knowledge, not money and jobs,” Mohamed says. “I always sent money home but it was not the main reason for leaving.” He describes his family and explains that as one of 13 children, he and his siblings all worked to help the family. Constrained by money and commitments to work, Mohamed scrutinized his options for graduate school and eventually discovered a realm of online degree courses. He laughs when he considers his choice of epidemiology. “It was never what I wanted to study. On my list, pathology was top and epidemiology was last,” he says. “But online programs were rare, and the first one I could find was in epidemiology with the London School of Tropical Medicine and Veterinary College. So I enrolled.” Accepting the lesson he had learned with his first degree, Mohamed believed the course itself would eventually reveal to him why epidemiology was a discipline worth studying. Unfortunately, the online tutorials and the convenience of studying at home soon proved problematic. Resolved, Mohamed applied for a position on the full master’s degree program and was accepted. Scooping up enough money to buy a plane ticket, he flew to London and moved into graduate students’ halls of residence. Though he was finally back at university and satisfying his thirst for knowledge, Mohamed remembers this period as fulfilling but difficult. Despite spending long enough in America to become a permanent resident before moving to London, English remained a challenging language. Though he considered himself fluent, he found it tough to interpret the words and keep up with the pace of the teaching. At this point in the story he smiles again. “In my culture we say two things. Never brag, and never feel sorry for yourself.” Already embarked upon his degree, Mohamed saw the language barrier as a tall but conquerable hurdle rather than an impassable problem. With permanent residential status, Mohamed decided that moving back to the U.S. after completing his master’s degree was logical. In London, his dissertation project had involved collaboration with Purdue University. Now armed with a greater appreciation for epidemiology, Mohamed decided to pursue a Ph.D. in epidemiology at Purdue. Four years later after collecting his Ph.D., Mohamed stepped out of academia and accepted a job as a public scientist in the Department of Public Health (DPH) in Arizona. Although he had enjoyed academia, he was intrigued by the huge potential that government work offered, and was keen to put his training to good use. So, in 2016, Mohamed reached a new conclusion and left the DPH for a research position at NC State University in the Department of Biological Sciences. Within two months he was convinced his decision to return to academia had been the right one. He explains his satisfaction in team work: by being given the space and time to specialize further he can form an essential cog in a much larger and ever-advancing machine to answer more and more questions. When I ask what motivates his research now, he pauses to think for a moment. He returns to considering his belief that money should never be the goal. Just before we part to make our way to our own cars I remark on his extraordinary achievements, perhaps the most impressive being his decision to leave home so he could go against the norm and draw his own conclusions. I even suggest that these actions make him brave, but he shakes his head. That’s not what it’s about.